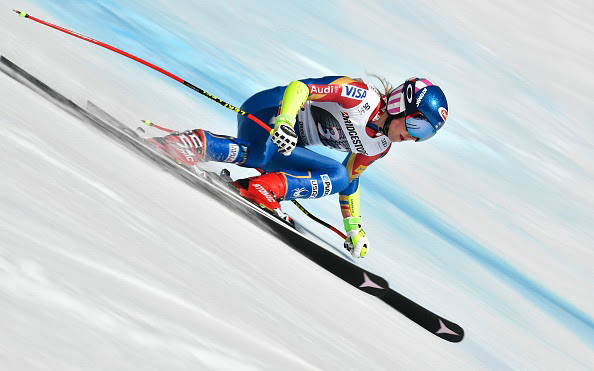 Crans-Montana, Switzerland – Colorado’s Mikaela Shiffrin won her first career Audi FIS Ski World Cup alpine combined event in Crans-Montana on Sunday, and increased her overall World Cup lead heading into final races of the season. Racing once again under brilliant blue skies and on a soft track, Shiffrin laid down a solid first run of super G, and then attacked the second run slalom to take the victory over Italy’s Federica Brignone in second, and Slovenia’s Ilka Stuhec in third. Stacey Cook, of Mammoth Mountain, Calif., was the only other U.S. finisher in 23rd. Laurenne Ross, of Bend, Ore., was 14th in the super G, but did not finish the slalom run. With her victory, Shiffrin picked up 100 World Cup points and now leads Stuhec by 298 points with four World Cup races remaining before the World Cup Finals in Aspen, March 13-19. Shiffrin also leads the overall World Cup slalom standings and is second in the giant slalom standings, 120 points behind Tessa Worley of France. “As for my overall lead, I think Ilka is going to put up a really good fight, so I’m certainly not losing focus,” Shiffrin said. Stuhec wrapped up the overall World Cup alpine combined title with her third-place finish Sunday. She also leads the World Cup downhill standings and is third in the World Cup super G standings – just 16 points behind Tina Weirather of Liechtenstein – heading into next weekend’s Olympic test event races in Jeongseon, South Korea. Four World Cup events remain before the World Cup Finals, with downhill and super G events in Jeongseon, South Korea, March 3-5, followed by giant slalom and slalom races at Squaw Valley, California, March 10-11.